S-COMM is a portable or permanent real time colour under vehicle surveillance system (UVSS/UVIS) designed and manufactured in the UK by SAE Systems to provide affordable, robust and dependable under vehicle examination at vehicle check points on any terrain day or night. S-COMM’s unique adjustable camera arrangement allows the end user to position each camera in a forward, vertical or rear facing position enabling sharp and accurate under vehicle images penetrating even the deepest recesses. Its high intensity led illuminated cameras coupled to the latest in Sony camera technology ensure sharp and accurate high frame rate imagery and video feedback to the controller day or night and in any conditions. Rated to IP68 the electronics and camera package is water resistant and can be located on virtually any terrain prone to flooding. 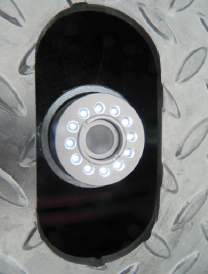 The simple plug&play set up procedure means the S-COMM Under Vehicle Inspection System (UVIS) can be installed on site and working in a matter of minutes in a portable format or permanently bolted to the road surface in less than an hour. The Fusion 5X 1080p TVI is a class leading high definition digital video recorder providing up to 1 month of recording time on its integral 1TB hard drive, in conjunction with the Flexscan S1934 19” LED Monitor the S-COMM6 UVSS provides the operator with the latest in TVI image quality. The S-COMM UVSS / UVIS system comes supplied with a 6 camera configuration, designed specifically to handle both standard sized vehicles and also larger HGV/Tractor vehicles. It is an ideal under vehicle inspection system UVIS where vehicle undersides need to me checked and monitored whilst being able to keep the traffic flowing. Specific attention has been given to the cable and wiring looms, the UVSS to DVR cable link is engineered from multi-core coaxial cable individually shielded in PVC and steel flexible conduit capable of standing up to constant vehicle traffic without any fuss or impact on the integrity of the cables. Each cable loom is 10m long as standard, allowing plenty of flexibility in the location of the UVSS / UVIS in relation to the control point. The cable can be tailored to meet customer requirements if longer or shorter lengths are required. No compromise has been made in the build quality of the S-COMM, its rugged design means virtually no maintenance is required. Training is minimal and fully covered by the user information provided with the system.